What are “Soft Skills” ? If you haven’t heard the phrase “soft skills” basically it means, how to you teach that stuff students aren’t assessed on in class. We used to call them social skills, manners, etc… Now it includes a bit more like how to handle a bully, and what to do in an emergency. These soft skills may be the most important things you actually teach your students this year. More than how well they read, how well they can navigate various social situations (Sometimes referred to as emotional or social intelligence), predicts how successful students are in their future lives. 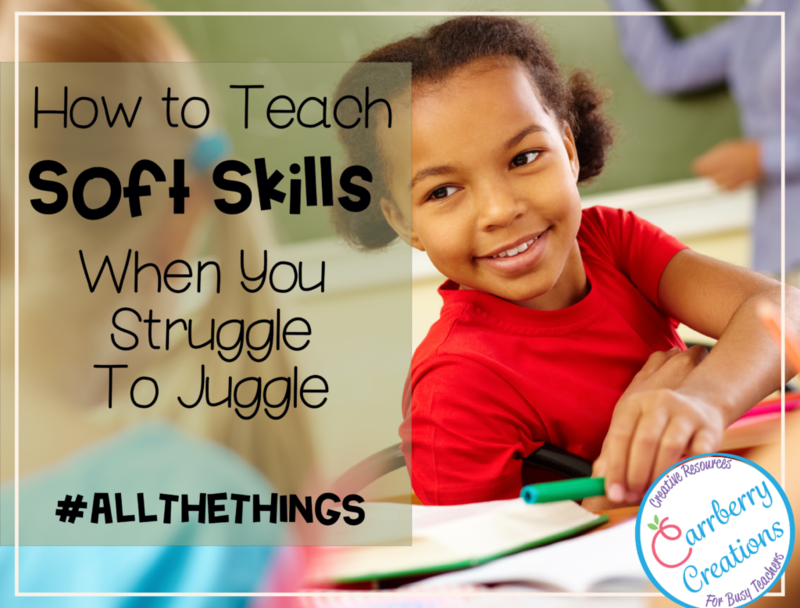 So how do we teach soft skills in the classroom, when we have NO TIME? In many schools (mine, my children’s, my sister’s to name a few) PBIS has become the norm. What it essentially amounts to is using loads of positive praise in the classroom daily to focus students in on what behaviors we want to teach. 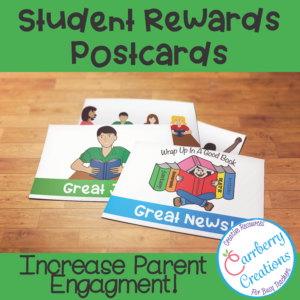 Schools tend to adopt school wide behavior incentives, such as praise tickets, used to purchase prizes in a school store, or admission to a fun event at the school. Teachers (or teaching teams) are often left to devise their own in class rewards and incentives. The most important reward is positive praise. (And BONUS it’s free! I love free!) when trying to hone a specific social skill in the classroom it is important to model the skill yourself frequently, and immediately praise any student you see even coming close, then work from there to require better and better behavior. 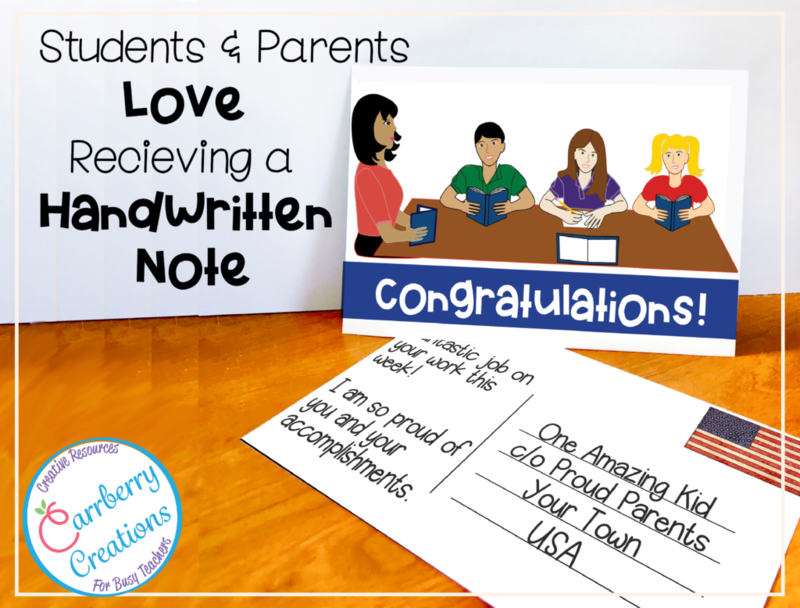 Kids love to hear they did something well, and modeling giving each other compliments is another bonus to this strategy. For your own sanity, choose 1 or 2 things to really highlight at a time. For example – you may choose to focus on sitting appropriately and raising your hand at first, then step it up to asking questions with “please”, and properly using “thank you” and “your welcome” next. Once most students have “got it” then it is time to work on what they should do to handle those students who don’t “get-it”. Or whatever seems to be the greatest needs of your students. Let’s face it! Compliments don’t always work for all kids. Some kids need a tiny bit more to encourage progress. 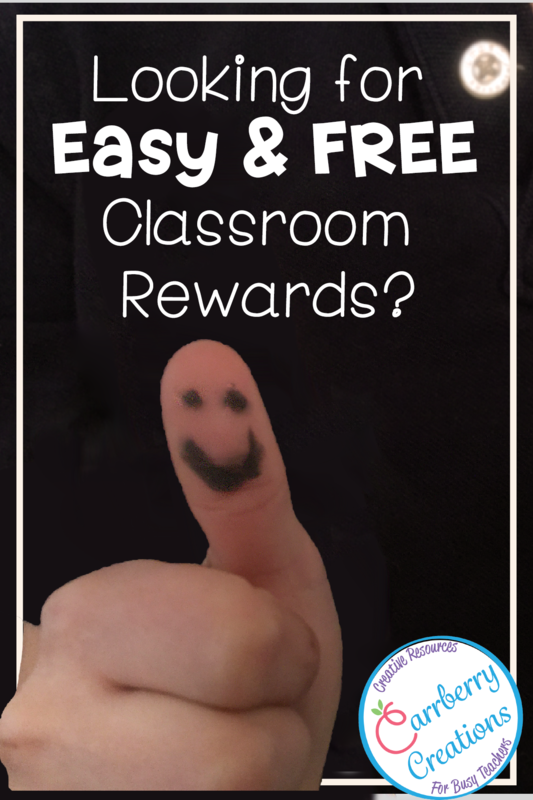 With that in mind, I thought I would share with you some of my favorite free (or nearly free) rewards I give my students. 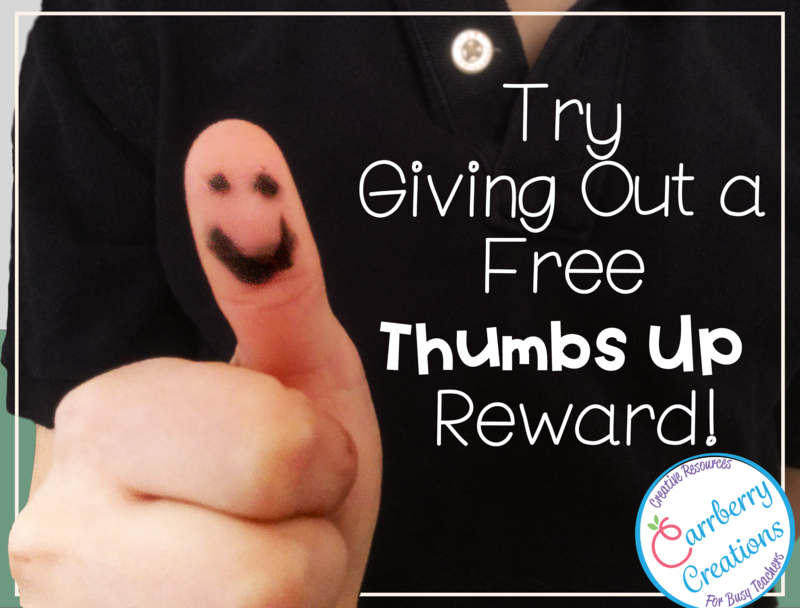 To give your student a “thumbs up” reward grab yourself a washable marker and ask for a thumb. Draw away, and if it washes off let them earn it again and again during the day – Kids love it and it is next to free! These prizes need to be prearranged with an administrator, or with another teacher but kids LOVE them. Like most teachers, I do have a prize box filled with trinket-toys like bouncy balls and erasers in it for students to earn during the week. The favorite prize of my students though is a worn out note card that says “read to the principal” seconded only by a handful of equally worn out note cards which say “read to a kindergartner.” I just wrote those phrases out on a handful of index cards and stuffed them in among the other prizes. Week after week my students are eager to be first to the prize box to pick those prizes out. I stick their cards with magnets to my dry erase board, write their names next to the magnet, and call the principle and kindergarten teachers to schedule a time for the child to come read to them/their student. (Scheduling sounds like a lot but typically the kindergartners all have the same good time every week – administrators are the tricky ones). My students have to practice their book over the weekend (They actually WANT to do homework over the weekend – love it!). The next week the go read at their appointment time and their card goes back into the prize box for someone else to earn. 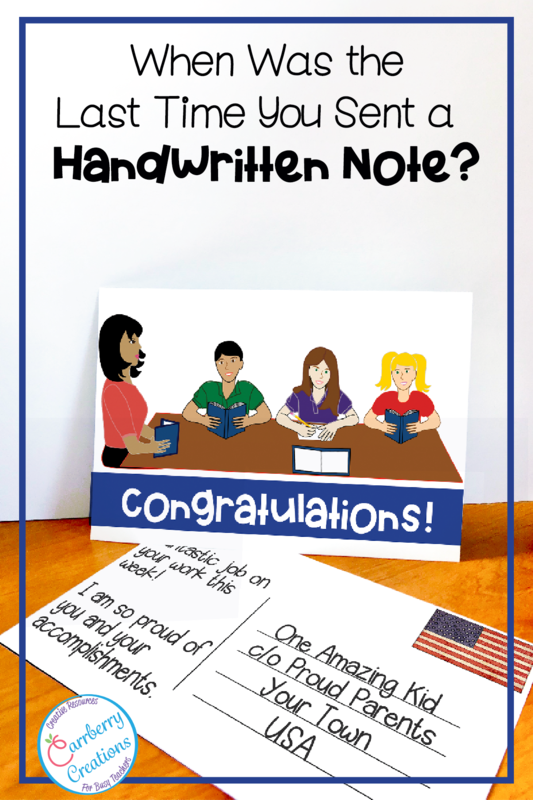 What you do is write a secret prize on a white paper (I like index cards for this) with a white crayon. When students choose a mystery prize they take the card and paint it with watercolor paint to reveal the prize. Some of the prizes I have written down, are sit in the teacher’s chair, no homework, sit with a friend. It can be used for class prizes such as extra recess, popcorn party, or extra time in the computer lab. I keep a class list in my lesson plan book for notes home. Every week I choose 2 students to send a positive note home from school. I actually mail these on postcards I had made up, I do write notes home as needed, but these are a bit extra special. I keep track on my class list of who has received a postcard and make sure everyone gets one (even the kids who drives me crazy has enough good stuff about them to fill a postcard out with.) Parents and students alike love receiving some of the good kind of mail, and while phone numbers seem to be ever changing these days, snail mail addresses seem to stay the same. Psychology Today| What is Social Intelligence? The Babble Out |What is Emotional Intelligence And How to Improve it? Those are just some of the ways students can be rewarded for and encouraged to do the right thing in your classroom this year. Have a great year!